A beautiful white wedding unfolded in the stunning environs of Shiv Vilas, Jaipur, as Disha and Kush exchanged vows in an outdoor ceremony. 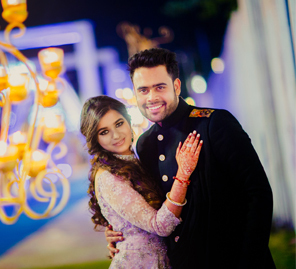 Disha and Kush credit their wonderful vendors for making sure that their wedding in Jaipur was as close to their dream of a perfect wedding as they could have imagined. The happy bride shares highlights of the event as well as photos clicked by WeddingSutra Favorite - Hitched & Clicked. "Kush and I have known each other for the last 15 years. We first met when I was 12, and he was 15, and over time, we became the best of friends. From playing hide-and-seek together to discussing homework problems to college issues, we chatted about everything under the sun. The rapport we share today is still the same. The only thing that has changed is the topics that we talk about now! We knew right from the beginning that we shared something special as our innocent friendship developed into an unexplainable bond. I think we always knew that marriage was the ultimate goal for us." "My parents left no stone unturned to turn this wedding into a beautiful painting. It was the exact replication of the images that I had sketched in my mind. Be it the location, decor, or just about any other small detail, everything was finalized keeping our vision in mind. They put in their sincere efforts into making our wedding memorable and beautiful. The results reflected that." "We picked Jaipur-based The Bhagwati Events Co. as our wedding planners. They worked on this wedding not only as professionals but also like a family. They never denied us anything, not even last-minute requests. Every little detail was customized and executed to the tee. I had heard from so many couples how tiring one's wedding could be, but I had the most fun at mine! For those two days and nights, Kush and I danced as if there was no tomorrow, and so did our friends and family. All our worries were taken care of by our wedding planning team." 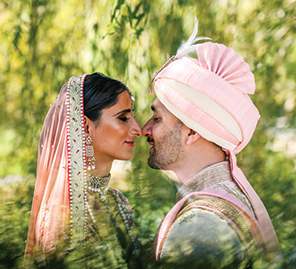 "For my wedding, I wanted my makeup to highlight my best features and make me look like the prettiest version of myself instead of making me look like a completely different person. Therefore, I chose a minimalistic and elegant look, and that is just what Misha Vig, my makeup artist, gave me. She incorporated my style into her work. I wanted to look like the bride but also wanted to look like myself, and that balance was struck perfectly by Misha." 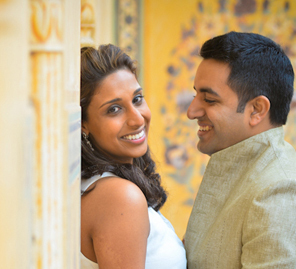 "We had Aastha and Gaurav from Hitched & Clicked as our wedding photographers. Those two are the best photographers anyone could wish for on their big day. They are very easygoing, but at the same time, they don’t miss a single aspect of your wedding. The pictures they capture look like paintings. 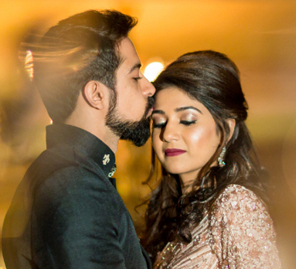 Kush and I are both crazy about treasuring memories in the form of photographs, and the duo gave us the most prized possession from our wedding - our photograph collection. Booking them was the most last minute yet the best decision we made!" "Our wedding setup was breathtaking; and while it was customized keeping our preferences in mind, there were some great inputs from our planners as well. On the big day, all our dreams and plans were executed impeccably, and the decor completely reflected our tastes - minimalistic, elegant, fresh and beautiful. Our wedding venue was a pastel delight with flowers in muted pink, orange and white. From the splendid long table setting to the gorgeous photo booth which read 'Together Forever,' everything was exactly how we wanted. Keeping in line with the theme of the wedding I wore a white gown and Kush opted for a powder blue tuxedo."